A new Russian advanced stealth submarine, dubbed a “black hole” by NATO for its ability to be undetectable, has begun preparations for deep water tests. However, it must first make a 4,630km journey to the Barents Sea in Russia's north. "The crew of the electric diesel submarine Rostov on Don which was handed to the Russian Navy by Admiralty Shipyards has started the preparation for the passing from the Baltic Sea zone to the Barents Sea,” Captain Igor Dygalo from the Ministry of Defense said. Before the submarine begins its test operations, it must travel about 2,500 nautical miles (4,630 km) from St. Petersburg to the Barents Sea in Russia's north. After finishing all scheduled tests, the submarine will travel to its future permanent place of service in the Novorossiysk port in the Black Sea. 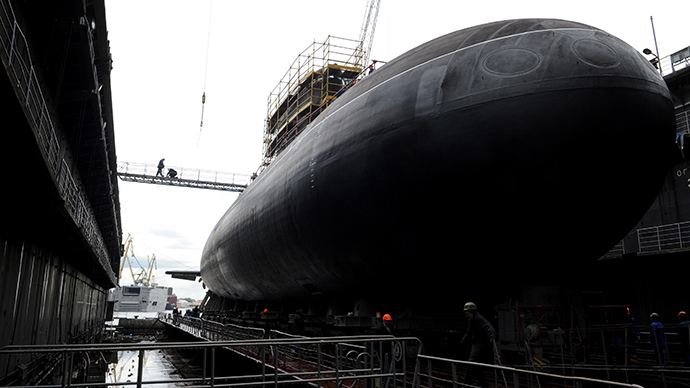 It is the second submarine out of six planned for the Black Sea Fleet by the end of 2016. Known as 'Improved Kilo' under NATO code name, Rostov on Don is the first trade-off model of the third generation submarines of the Varshavyanka class (Project 636) underwater ship. The diesel-electric stealth sub is believed to be the quietest in the world. It also possesses an extended combat range, and its relatively small size helps it maneuver in shallow waters. The sub carries 533 mm torpedoes and eight surface-to-air missiles, in addition to a new Caliber land attack cruise missile complex. Its tonnage is 4,000 tons; its underwater speed reaches 40 knots (37 km per hour), and its maximal submission is 300 meters. Its crew consists of 52 persons and it can fulfill its duty autonomously for 45 days. NATO has called this type of submarine a “black hole” for its ability to remain undetected. The new submarine, along with other vessels from the Project 636 class, is mainly intended for anti-shipping and anti-submarine missions in relatively shallow waters. It can strike surface, underwater, and land targets. The Varshavyanka class subs will be tasked with patrolling Russia’s maritime borders and protecting Black Sea coastal territories. The submarine construction started in November 2011 in Admiralty Shipyards in Saint Petersburg, and finished at the end of 2014. It is named after the city of Rostov-on-Don in Russia’s south.